There are signs that Spring is attempting to make an appearance. But don't be fooled by the image above. 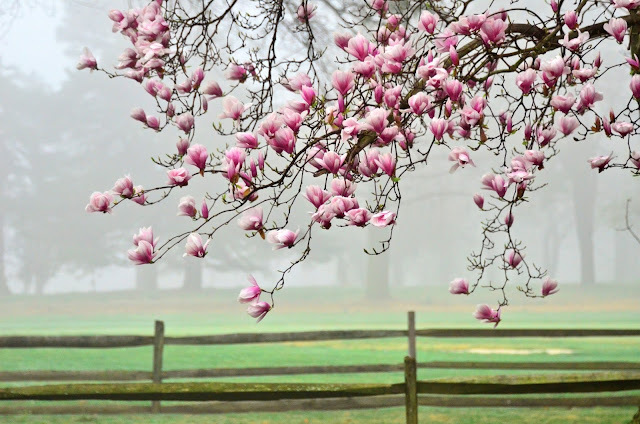 There are no blooms or blossoms in my neck of the woods ... yet. I was looking at photos from a year ago, same time, and we were in full bloom. I guestimate that we must be about 2 weeks behind last year's blooms. Come on SPRING! But then, Mother Nature moves at her own speed. Time keeps marching forward. There's nothing like nature to remind me of the frailty and beauty of the world, even in my own back yard. Prior to my Big camera, I took little heed to all the activity right under my nose. It's like a regular soap opera out there!! 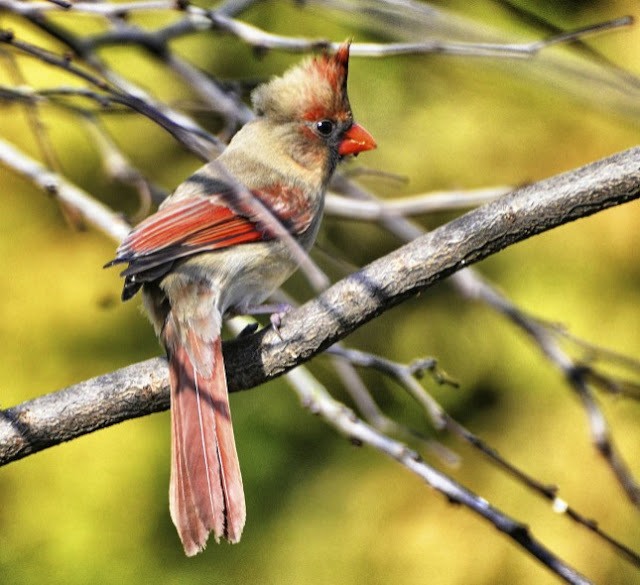 Take Mrs. Cardinal, for example, who lost her tail last month due to fright molt, probably barely escaping with her life from some predator. But it has grown back as if nothing ever happened. 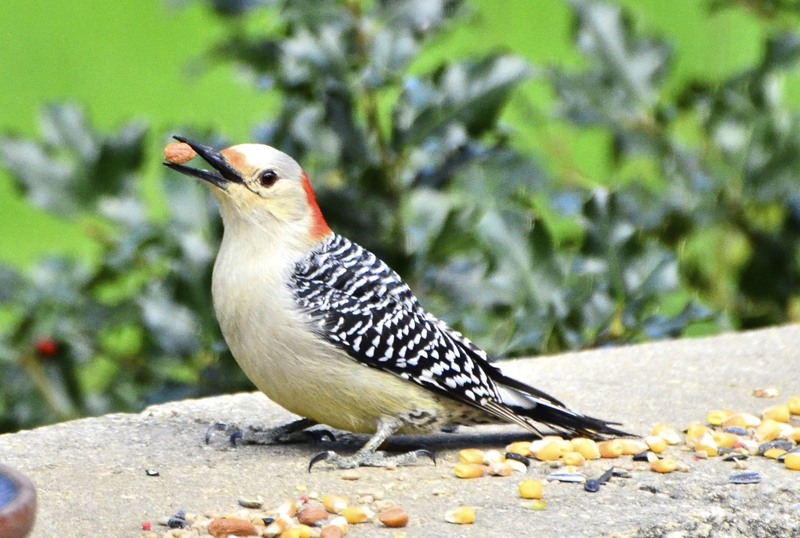 Or the loss of Mrs. Red-bellied Woodpecker's mate who was attacked by a hawk right outside my office window. She still comes to feed and someday, I hope she'll bring another mate along. And then there are the little chipmunks. Last summer, there must have been a half a dozen of them running around but so far this spring, I've only seen one. Several days ago, for two days straight, she was chirping all day long. Upon googling why she was doing that, I discovered that she was calling for a mate. Perhaps that was due to us finding a dead chipmunk in our basement two weeks ago! How and why he was in our basement is beyond me and why he laid dead in the middle of the floor is a mystery. Poor little fella! But she continues on ... if not a bit cautiously. The hawk swoops by daily. I'm also wondering if she found a mate. Her chirping has stopped! The squirrels have been extremely active. This little girl has been hard at work building a nest. Beginning of another new cycle of life. with the desire and need to march forward. Mother Nature pushes us onward. Even when we are so exhausted from the thrill of it all. I'm ready and waiting Spring. Such a wonderful post, Reena, and beautiful captures and SO TRUE!!! We started to see a little color here earlier than usual, but for the most part the skies were so gray, I couldn't get any decent captures and too little time as well!! But I'll get there in the meantime I can enjoy yours! Thank you for sharing and have a great week! yay for ms. cardinal! so sorry mr. chippy lost his way! 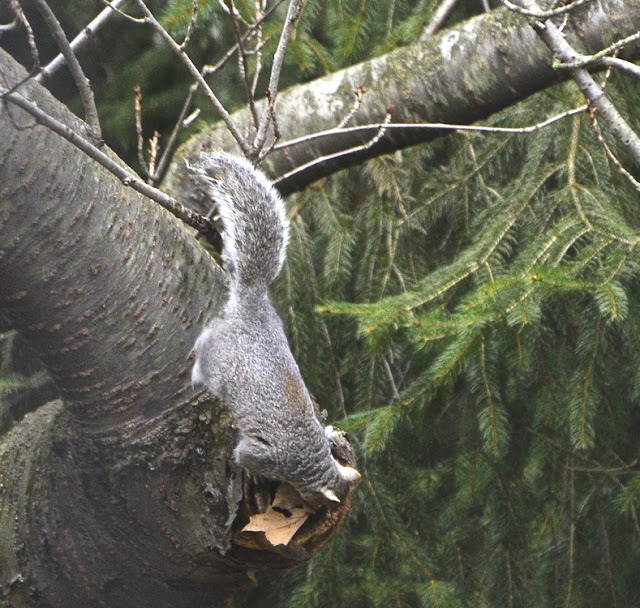 and that gray squirrel at the end is adorable! I so agree! Come on Spring! What a smashing post! I loved every word and image! It's amazing what goes on when we take the time to look. Love this! 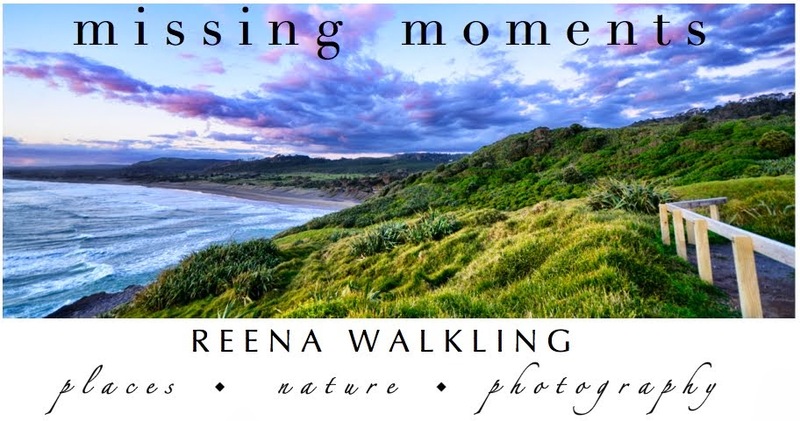 Gorgeous photos, Reena. So sad about the wee chipper though. I once found a tiny mouse in the middle of my basement also.. another mystery. I loved reading about all the adventures going on in your back yard and so glad that you are so observant to see all the activity..
We are still below normal. Those trees look great on a sunny day. I always forget the names of the trees. 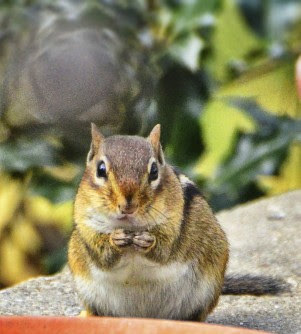 Wonderful pictures and I adore chipmunks and very much hope she has found her heart's desire. With us it is the tang in the autumn air and the first touches of colour and swelling apples. Just like with your snows and our dry and sere landscape, it is thrilling to see things greening up. It's so wonderful to see all the personalities that you've captured here, Reena! You have such an interesting back yard. Sometimes we miss the things that are actually right under our noses! Great blog. I sure do hope the cute little chipmunk found a mate. 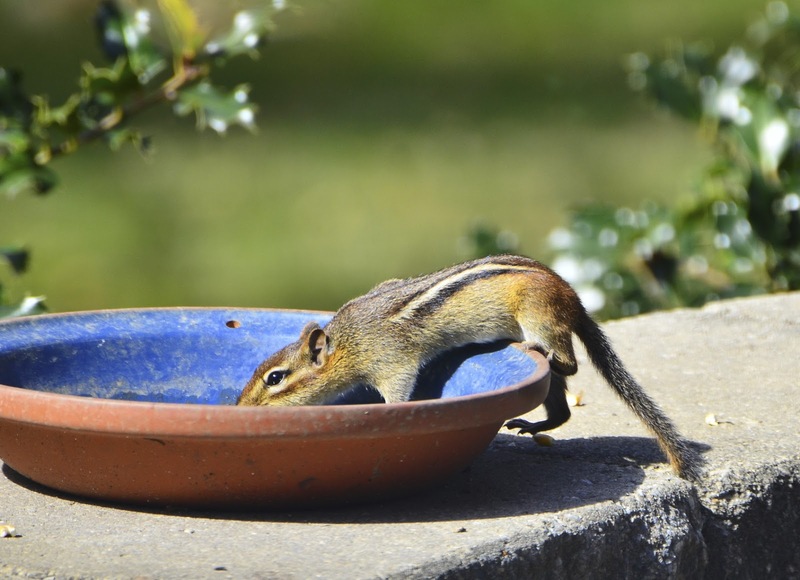 Have you ever been able to entice any of the chipmunks or birds to eat from your hand? Indeed, we've all been waiting for Spring for a long time this year. Your first photo is lovely and just what we need after a long winter. Thank you. Yes, Mother Nature needs to find the accelerator pedal and get things moving. I see lots of daffodils and crocuses but not much on the trees. Nice selection of photos. I just love the images of all the visitors in your backyard. So glad Mrs Cardinal's. 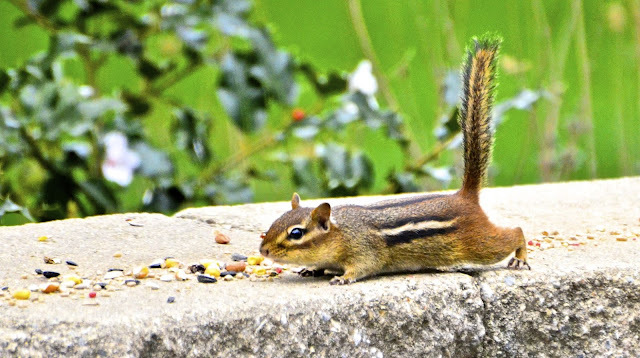 Wish we had chipmunks and squirrels visiting us, I miss their antics. Guess they have enough food in the woods to both with bird/squirrel feed. 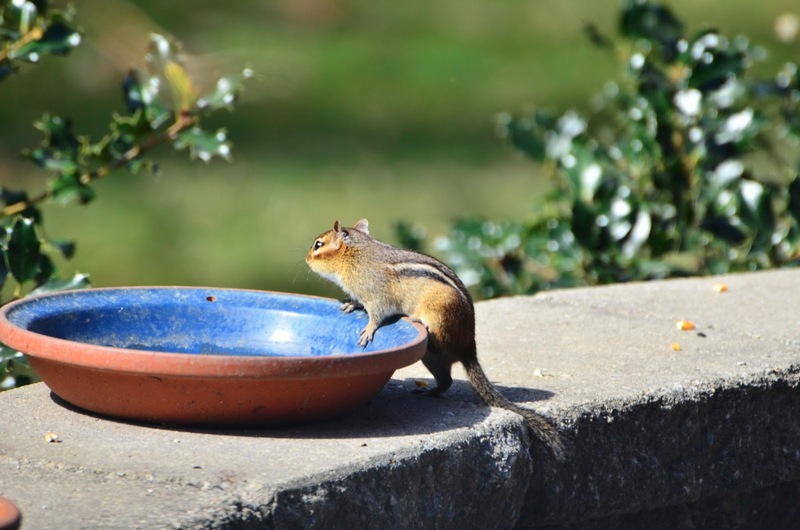 I saw a chipmunk across the street last year but never visits around my feeders that I know.They are fun to watch, I used to share my lunch with them and a stellar jay at a park when I was in CA. These are wonderful Reena. I love your little chipmunk friend, and the first photo here is absolutely gorgeous. aww, great shots. i always wonder why i love chipmunks but squirrels i dislike. the little chipmunk looks like he is doing yoga or at least stretching. so cute!! Aww...that little guy at the end must have had a hard day's work! I, too, have thought that blooms seem to be a bit late this Spring. Great stories, and very cute critters, the chipmunks are favorites of mine, but that last picture of the squirrel napping is priceless. Yeah for Mrs. Cardinal's tail. 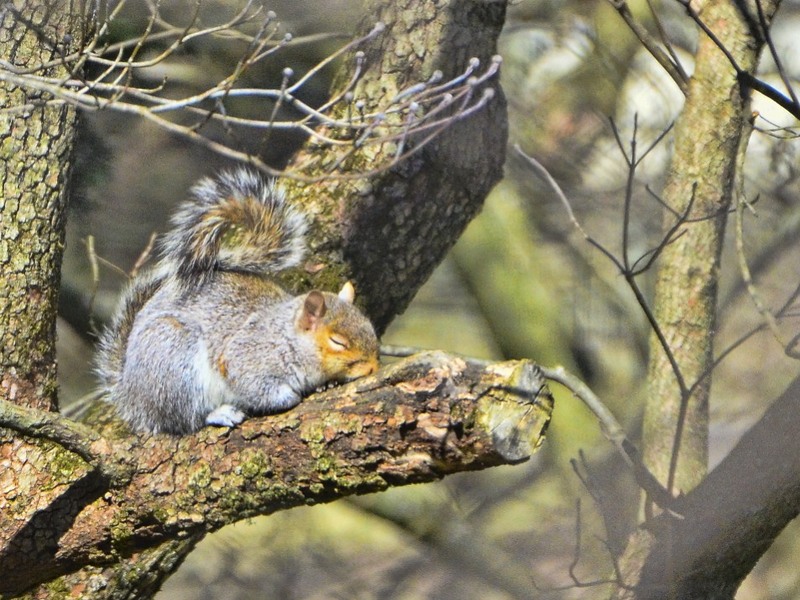 I saw a squirrel napping out my window one time a few years ago. First and only time. As active as they are it sure is a funny thing to see. Lovely photos. Spring really IS slow in coming this year! What charming critters shots. Love those spring blossoms. Mr. Spring has missed the flight. Mrs. Woodpecker looks almost as though she were smiling! The Happy Widow, I guess! Reena, as always I so enjoy your post on your wildlife. I love that you keep up with them and their little lives. Your stories are so wonderful! That first photo stopped me dead in my tracks! Breath taking! Congrats on your POTW. What a nice pause before I begin my morning. My yard is also an ongoing soap opera! came back to say congrats on your POTW!!! I thouroughly enjoyed visiting with you, brilliant images and heartwarming tales, thank you! Congrats on the POTW! Love seeing all your critters again. Spring and winter do seem to be playing a game with everyone, although we aren't getting the extremes everyone else is, at least. Hang in there!